Everyone knows the first song played on MTV when it launched 35 years ago today. But did you know this one was the second? Well, now you do. You’re welcome. And here’s another tidbit: the lead singer for the Buggles? Trevor Horn. Yep, that Trevor Horn. 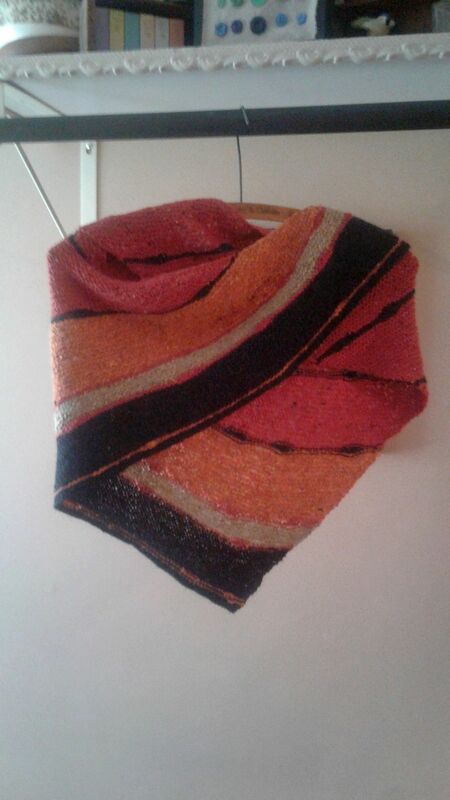 It’s good to finish a shawl. This is my take on Ropedance by Melanie Berg. 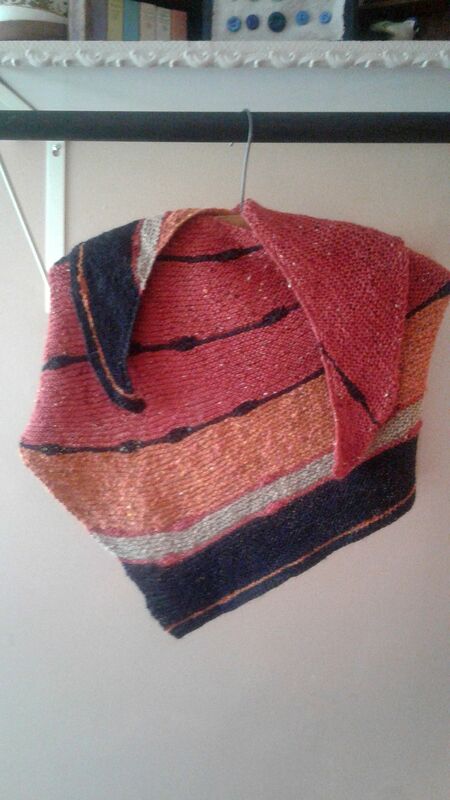 I reused the yarn I frogged from Veldt (it really didn’t look that great on me.) 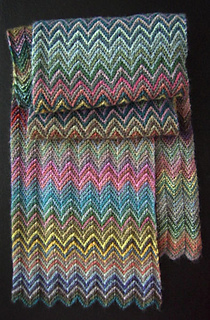 I played around with the colors and the line “bloops” – which are just a pattern of short rows. I think it will get a lot more wear than the sweater would have. 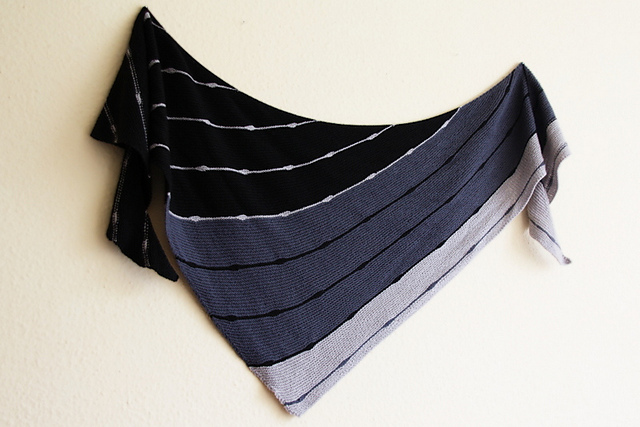 And now I’m eyeing up this pretty. Apple Music has been my new go-to for work day music. I really like the options it provides based on my existing iTunes library. And if I like a song on a playlist, I can save it right to my library. Where it will stay forever or until I unsubscribe to Apple Music. It’s kinda fun to see what Apple thinks I would like to listen to, and I’ve even found some new favorites! This is the time of year that I am especially homesick for PA: it’s the Volunteer Firemen’s Carnival season. There are some people who don’t care for carnivals, but I would argue those carnivals may be ones just shy of fairs with sketchy rides and even sketchier people. The carnivals I grew up with were almost all local food, stands, and games. You went to a carnival to see people from the neighborhood, see kids from school (ah, the days before social media), and walk around as the hot day cooled down to evening. The food was all homemade: home-cut fries, ice cream with texture of ice milk and a flavor punch you couldn’t get from the grocery store, cakes of every variety donated by women in the community, ham and bean soup which was strangely satisfying on a summer evening. The carnival took all of 10 minutes to stroll around at a leisurely pace and there was a new person to chat with on every circuit of the field. 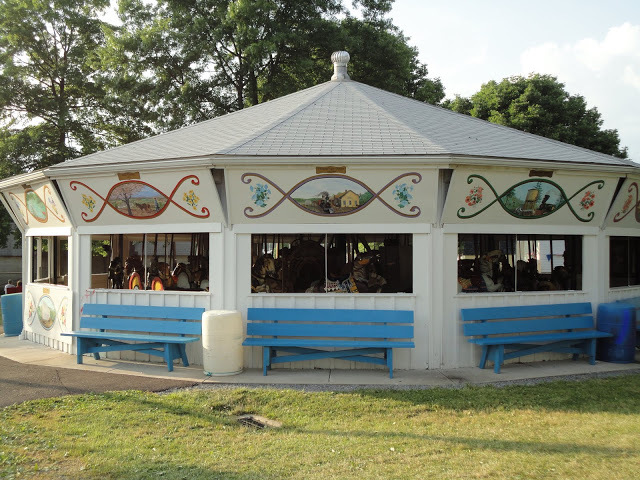 The first two weeks of July contain my two favorite carnivals: the Millville carnival with its huge July 4 parade, awesome closing night fireworks show, homemade caramel corn, and one of the best carousels I’ve ever been to (and yes, I have been known to ride it when I’m in town.) 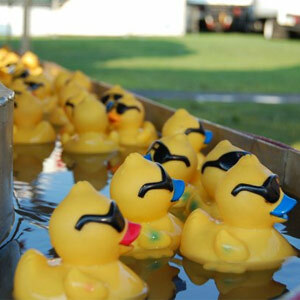 The week after Millville is the Lightstreet Carnival. This is the carnival I grew up with: close enough to walk to every night if I wanted (you know, when it was still relatively safe for kids to go somewhere unattended because the whole town looked out for its own), working the cake and ice cream stand when I was old enough, and hanging with my girls, flirting with the guys who wouldn’t give us the time of day in school. Today is the 31st anniversary of LiveAid. I know I have talked about this before: I was glued to my TV for the whole concert and somehow even years later, this event embodied 80s music for me. Sure there were artists that didn’t play for a variety of reasons: Springsteen and the E Street Band, Prince, Tears for Fears, Michael Jackson, Foreigner, Eurythmics, Van Halen, and Depeche Mode. But the energy that was sustained for that day is still palpable when you watch the videos. Here’s one of my favorite clips from the day – a day which fell just over the exact middle of my favorite decade. I mentioned a few posts ago that the CatMan and I are moving to the apartment across the hall from our current apartment. One of the first things we are going to do is purchase a queen-sized platform bed and mattress. Of course, we are going to try to do this without breaking the bank. We already know the mattress we want: now to find the bed. 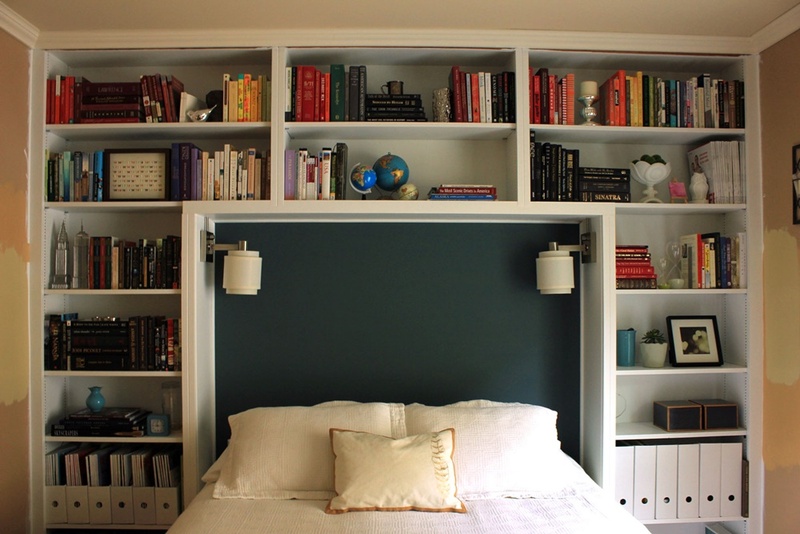 I’ve always liked the bookcase headboard idea – look at this beauty! I think this will look pretty and could easily be decorated if the mood strikes. Say, greenery-wrapped in the winter, maybe some fairy lights? 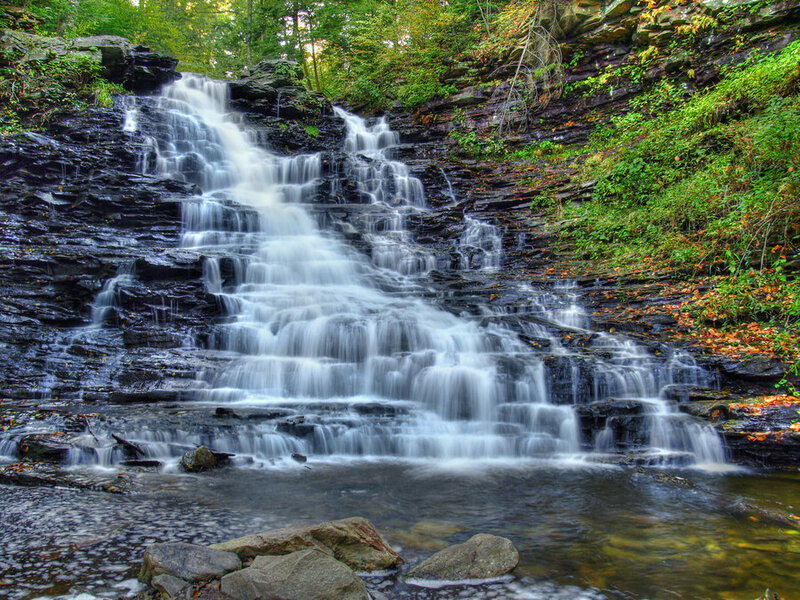 This is one of the falls at Ricketts Glen State Park in PA. Doesn’t have anything to do with this post; I’m just missing home. So back in October, I started my bullet journal. I’m still going strong and will do an anniversary post in a few months. But one of the things I want to do is take a look at my 2016 goals, now halfway through the year. 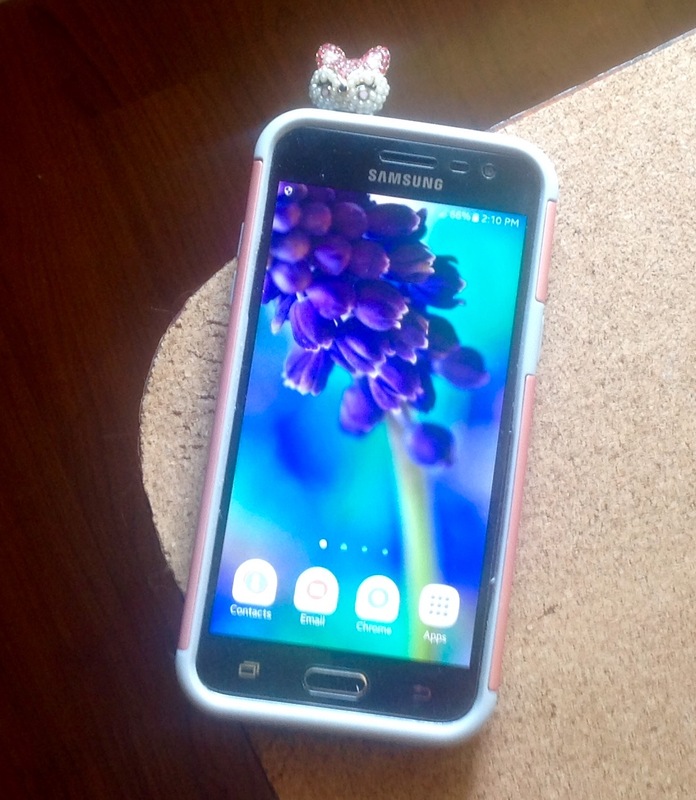 Oh, another thing that happened while I was off-blog was a phone upgrade. Seems the CatMan’s phone was still 2G which becomes inactive at the end of this year (and yes, it was a flip phone.) So on my day off, I visited our local AT&T store to check out options. Back when I got my Go Phone (at least 5 years ago, I think), you could only get the phones online and the actual storefront (at least here) was a bit snooty about no-contract phones. However our AT&T plans have treated us well, so I decided that I would brave the snoot to address the upgrade. Wow, big difference this time around. The service staff could not have been more pleasant or more fun to deal with AND they had a complete selection of no-contract phones in stock at the store. No hard sell, no snootiness, no drama. We enjoyed talking about streaming shows, and Netflix vs. Hulu. In fact, I was so pleased by my experience, I upgraded MY phone right then and there. I chose the Samsung Prime Express. The only thing that wasn’t available at the store was a girlie hard case, but Amazon to the rescue. 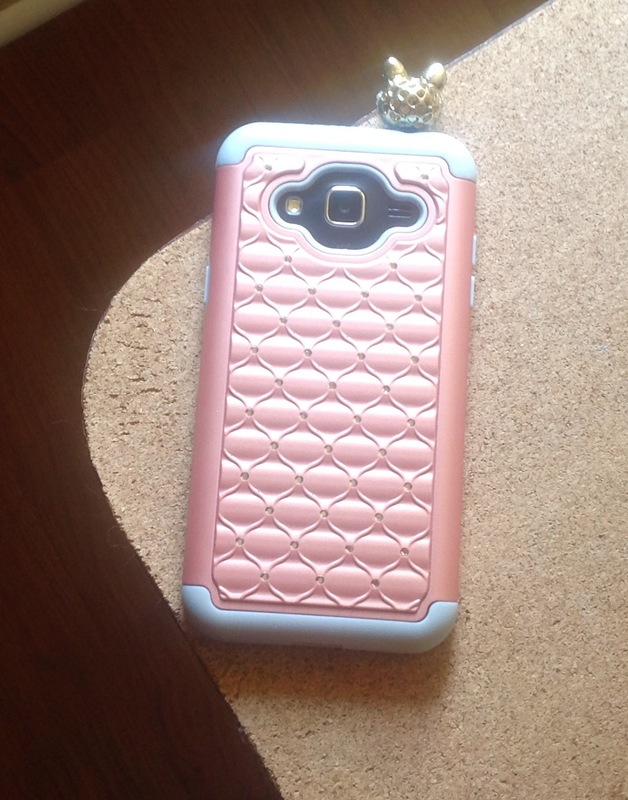 I picked out a rose gold case with little rhinestones embedded in the back. And because I’m a 14 year old girl in a menopausal body, I had to order the little rhinestone fox dust plug. And yes, the CatMan got his upgrade too! And yes, it’s still a flip phone. Bigger and beefier with 4G. So what’s going on, peeps? Actually I’m mostly up-to-date on my blog reads, it’s just this blog that is still hanging out in March 2016. It’s all been good stuff for the most part on this end: work is a little complicated right now since I’m training someone. But let’s see what’s happened since we chatted last. 1. 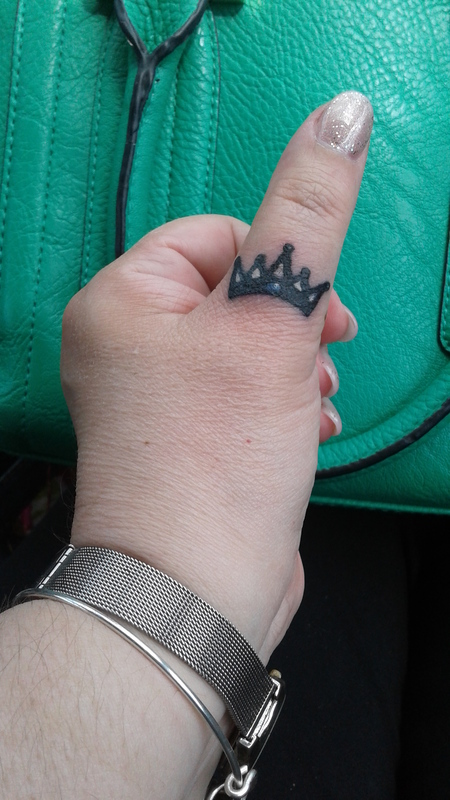 I got a tattoo! The CatMan and people at work call me “Queen” – I thought it was high time to make that official. It’s been two weeks now, and the peeling and itching have subsided. My little blue ‘jewel’ didn’t take too well, but overall I’m pleased with how it turned out. 3. We’re moving! Ok, it’s just to the apartment across the hall, but there are some great perks. We will have two bathrooms (*insert happy heart eye emojis here*), the apartment is on one floor (currently we are on two floors), and the apartment has been renovated recently. We will also have windows facing the lake which means a great cross breeze (right now, our second floor doesn’t have that feature, which means things get toasty fast upstairs). In September, we will have lived in this building for 20 years, so I’m looking forward to some new, updated features and a bit of a smaller space to clean and decorate. 5. I celebrated my 1-year yoga anniversary in May. Still enjoying it: my favorite is the weekly yin class. Being able to just relax deeply in a few poses for a whole hour is actually quite revitalizing. 6. I finally went through all my Pinterest boards (using some of the tips found in this blog post), deleting stuff and re-categorizing the boards I already had. Oddly cathartic and I’m enjoying my “Konmari”-d account. So life keeps on keeping on here. My goal is to move the blog back to the passenger seat so we can go on this ride together. I promise to stop for bathroom breaks and Starbucks iced vanilla lattes. Sorry for the posting fail! It’s gonna get better, I promise!